This week sees the start of the 2010 US Masters at Augusta National in Georgia, USA. Last year saw Angel Caberra win his first ever major championship when winning the coveted Green Jacket that is awarded to every Masters champion. The big news of the 2010 Masters must be the return of Tiger Woods after his few months out of the game of golf due to personal reasons. The field is quite open this year and there are some great betting deals to be had. So why not take a chance on your US Masters Golf Betting. Also do not forget to check out the Grand National Betting pages here at Findabet with the famous race being under a week away! Paddy Power have released their video of betting advice for the 2009 British Open. Looks like they all had a great day in the Car Park, hopefully the Turnberry weather will be better! Just thought I would share this amazing shot with you at the time of the 2009 US Masters. This has to be one of the best ever televised golf shots, Amazing! Be sure to check out our page dedicated to 2009 US Masters Betting. The 2009 US Masters gets underway this Thursday the 9th April 2009 from Augusta Georgia on the famous Alistair McKensie course. If you fancy a bet, Tiger Woods is the current favorite running at 15/8 with Phil Mickelson at 8/1. 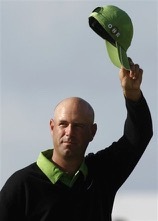 Be sure to check out our 2009 US Masters Betting Guide and Good Luck!